It’s an exciting time at Digital Creator Timmins! Consider this a “production log,” as I write to you smack dab in the middle of our March Break Movie Week! Today was the second day of production (or filming) for our fearless movie crew. The script is rock-solid, the footage looks great, and they can’t wait to move into editing! This week has been great so far! Everybody has been so vocal with their thoughts about the script, what shots are and aren’t working, and what we can all do to make the film that much more awesome. On top of that, pretty much everybody, myself included, has an acting part in the film, which is amazing, since, y’know… Us creatives tend to be shy! The teens have been working so hard to make something special this week at the Library, and I think it’s paying off! Keep your eyes peeled for the release of their comedy short tentatively called “The Library” (in the style of NBC’s “The Office”) on social media some time in the next couple of weeks! 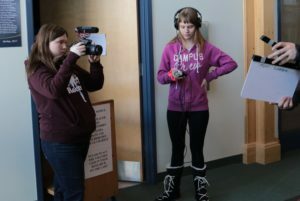 Above is a picture of Kayla and Cailey getting the slate in the shot like a couple of pros!